New kahili made by Keahi Luahine, 1920. Fourteen magnificent kahilis, completed after three months of painstaking toil by a Hawaiian, Keahi Luahine, of Kakaako, especially for the great Missionary Centennial Pageant of Tuesday next, were last evening, at 7 o’clock, ceremoniously conveyed from Kakaako to Bishop Hall, Punahou. Queen Liliuokalani attends historical play at Kapiolani Park, 1916. 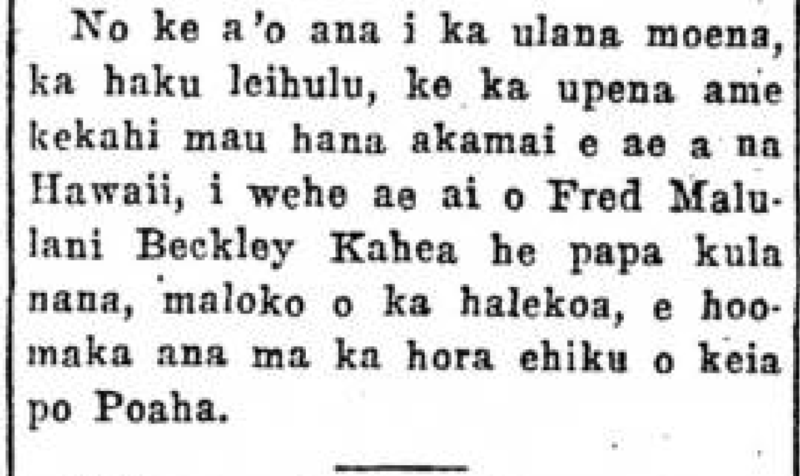 Pueo found in Kalihi, 1902. THE HAWAIIAN OWL. Photo by Williams. A NEST of four baby owls was discovered about three months ago by Dr. George Huddy in the Kalihi valley behind his residence. The discovery of the quartette of owlets is important in that few of the species have been found in late years. Three of them died shortly after being taken into captivity, but the oldest of the lot lived and is growing into a fine bird, and is at present about the size of a small pullet. He is thoroughly domesticated and makes himself perfectly at home in the residence of Dr. Huddy, mingling with the people without fear. The three dead ones were taken in charge by Mr. Bryan, Professor Brigham’s assistant at the Bishop Museum, and they are now stuffed and form a group with one brought to the museum about four years ago. It has been said at the museum that the owls are exceedingly rare and are valuable in the preserved state for the museum. The pet eats mice as well as raw meat. Dr. Huddy was quite troubled as to the manner in which the owl digested the bones and was rewarded a short time ago when the owl retired to a corner and began retching. Soon a quantity of bones issued from his throat, and the youngster then resumed his eating of further food. The owl is of the “horned” species. When approached by some one he does not know two groups of feathers on the back rise upward in a threatening manner and remain in that position until the stranger retires. If it is some one he knows the feathers fall back and he courts their attention. The owner of the rare bird states that none of his family have known of the existence of such owls in the Kalihi valley for the past forty years. They were at one time plentiful. The native for the owl is pueo. When fully grown it is the size of a large hen or the alala, or crow. Its feathers are mottled, its eyes exceedingly large and the claws are sharp like those of a cat. In appearance the owl’s head is very much like that of a cat. It catches mice, small birds and young chickens, on which it lives. The feathers were formerly made into very handsome kahilis. In ancient times the owl was thought to be a god and was worshipped by multitudes. Some families looked upon the appearance of an owl near their habitation as a warning of approaching death; others as the coming of good luck. On the hills back of Kalapu, in Manoa Valley, beyond the bluff on which the Castle residence is located, owls once inhabited the caves in great numbers. One of the legends of Manoa Valley gives the owl great prominence as god. The legend of Kahalaopuna shows that the owl was looked upon as such, a certain owl being known as the guardian of the beautiful maiden. Hawaiian Gazette, Volume XXXVII, Number 12, Page 5. February 11, 1902. Hawaii at the Great London Exposition, 1862. Kahili crafted for Governor Farrington, 1928. Yesterday evening, these kahili were shown in Waikiki. The kahili will become the property of the territory. According to Mokumaia, the workers are showing their congratulations to the governor as did the makaainana do for the alii in times past. On May 2nd, the work on the kahili began, and it was completed on the 17th of May. F. B. M. Kahea [Frederick Beckley Malulani Kahea] was the one who knew how to construct kahili. J. K. Mokumaia was the great general of the chiefs. [The beginning of the caption seems to be dropped out.] some Hawaiians are making five kahili to gift to Governor Farrington this coming 9th of June. 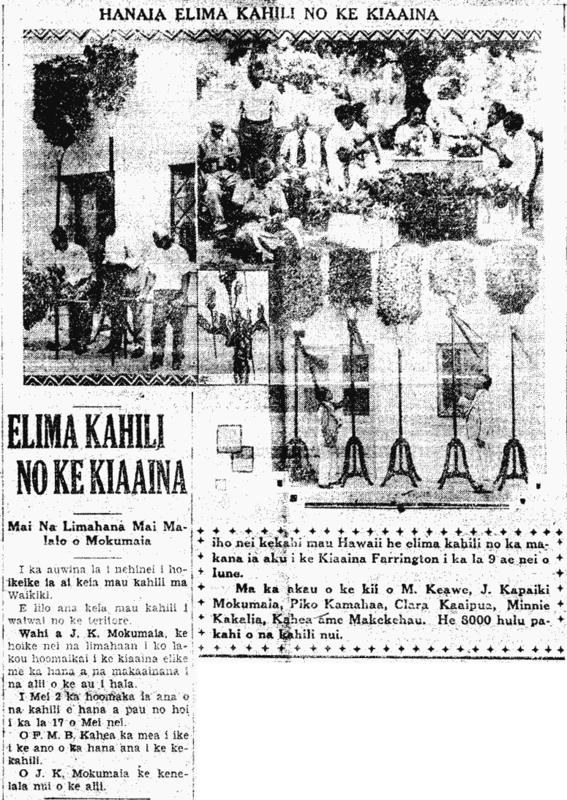 On the right of the picture is M. Keawe, J. Kapaiki, Mokumaia, Piko Kamahaa, Clara Kaaipua, Minnie Kakalia, Kahea, and Makekehau. The large kahili took 8,000 feathers each. Ke Alakai o Hawaii, Buke I, Helu 4, Aoao 1. Mei 24, 1928. Birthday of the Queen, 1902. The coming 2nd of September is the birthday of our dearly beloved Queen, the day that She first arrived and breathed in the sweet air of this world of light, from the loins of Her mother, high chiefess Keohokalole, and She has now reached the age of sixty-four. There will be a great royal audience for the people that day, from Her own makaainana to the people of other ethnicities. There will not be invitations sent out to each person, but it is open to all without hesitation, and there will be but one audience, from the haole, the rich and prestigious of the land all the way to the humble peasants; they are all the same. The only invitation to you all will be this public Announcement by the Aloha Aina inviting all those of this town who have aloha for the monarch. Rise! Get going! Go forth, big man and little man. File along to the royal audience with the Queen. It is understood that the American Commissioners [the Subcommittee on Pacific Islands and Porto Rico] will be present at this royal audience if they arrive before then. The audience will only be for two hours, from 3 to 5 p. m., Sept. 2, 1902, and Her royal residence at the grounds of Washington Place [Wakinekona Pa]. There will be many beautiful adornments displayed that day at the royal audience. There are new Feather Capes [Ahuula] and Kahili being skillfully crafted by Her own attendants who are skilled at the making of such things, under the guidance of Mrs. Heleluhe. So go and see for yourself, and not just hear about it. There will not be a meal presented that day, only an audience. The public is invited to go a fill the yard of Washington Palace until it overflows, showing the love for the alii. This will be shown once more in the paper of this coming week. 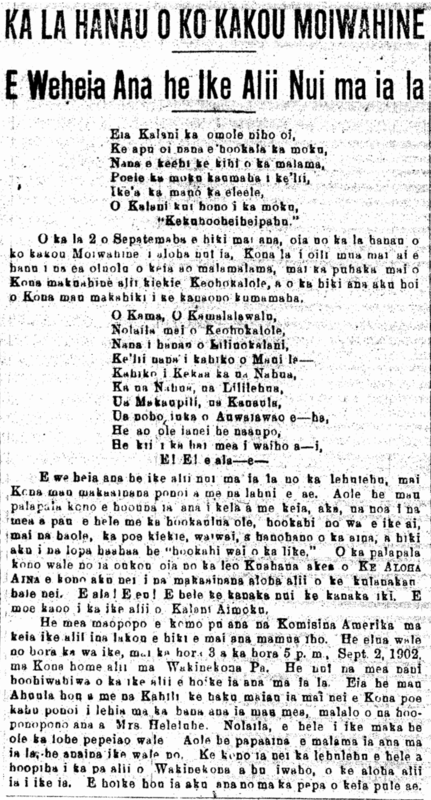 Ke Aloha Aina, Buke VIII, Helu 34, Aoao 1. Augate 23, 1902.